If late-night partying and dancing were on your agenda when you planned your trip to Kauai, you probably didn't do much advance research ahead of your trip. Oahu, specifically Honolulu, is where you need to go if it's gay bar-hopping you're after. Relaxing and somewhat sparsely populated Kauai has very few bars of any kind, much less gay bars. That being said, you will find some quite enjoyable nightspots around the island, from a few bustling taverns popular with locals in the Lihue area to some sophisticated restaurants and lounges in the resort areas - some of them located directly inside hotels - that make wonderful rendezvous spots for watching the sunset, enjoying a nightcap, or mingle with your companion or friends. Although none of the bars on the island are specifically gay, this is a very friendly and relaxed island where LGBT folks are for the most part warmly welcomed. Here's an alphabetical list of a few of the top spots on Kauai for nightlife and cocktails, some of them at least moderately popular with gay patrons and all of them worth checking out for one reason or another, plus a few notable restaurants. When choosing where to stay, be sure to pick one of the top gay-friendly hotels and B&Bs. Veteran restaurateur Jim Moffat, who ran some much-revered eateries in San Francisco before relocating to Hawaii several years back, operates sophisticated Bar Acuda (5-5161 Kuhio Hwy., Hanalei) in the historic heart of Hanalei, the enchanting north shore community near Princeville Resort that served as a backdrop for 1958 film South Pacific. Set amid a cluster of eateries and shops in the village center, this unpretentious yet decidedly hip spot with a strong LGBT following can be counted on for small plates of absolutely stellar farm-to-table fare (Medjool dates with oranges, toasted almonds, Manchego cheese, and arugula; grilled lamb riblets with French feta, roasted cherry tomatoes, and curry oil) as well as expertly prepared cocktails and a well-curated wine and beer selection. Dining and drinking ​are enjoyed on a breezy covered lanai, and the bar serves until 10 pm nightly (which is downright night-owlish for this part of the world). Moffat also operates neighboring Hanalei Bread Co., which opened in 2015 and serves organic bread, fine coffees, and tasty breakfast and lunch fare. One of the only true nightspots on the island, Rob's Good Times Grill (4303 Rice St., Lihue) is open until 2 am nightly and serves casual pub fare from the kitchen until 10 or 11 most evenings. A boisterous and convivial sports-themed bar with live music many nights (including swing dancing on Tuesdays), club dancing on Fridays and Saturdays, and karaoke, Rob's draws a predominantly hetero crowd, but you'll often find "family" in here, too, and everybody generally gets along well. The kitchen turns out well-priced comfort food - ahi poke, buffalo wings, burgers), and Rob's is in a small downtown Lihue strip mall that's just around the corner from a divey, no-nonsense restaurant called Hamura's Saimin, which has a passionate island-wide following for the Hawaiian delicacy (a ramen-like noodle broth) for which it's named. Eating at Hamura's and drinking and dancing at Rob's makes a pretty fun night on the town, and a great opportunity to mix and mingle a bit with locals. A smart and stylish Mexican cantina inside Poipu's upscale and open-air Kukuiula Village Shopping Center, Tortilla Republic (2829 Ala Kalanikaumaka Rd.) is the Hawaii outpost of a small chain with other locations in West Hollywood and Laguna Beach. 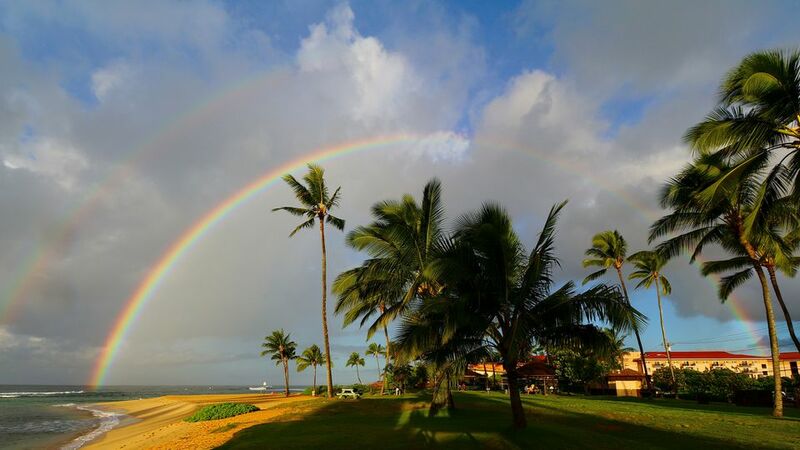 As its California locales both have strong LGBT followings, it's not surprising that this lively restaurant and bar in near Poipu's many upscale resorts and condo communities is also a favorite spot in Kauai with the gay set. The attractive spot has two distinct spaces, with the upstairs grill offering a more upscale experience and substantive food, including table-side guacamole, local ceviche, chicken tinga mole de poblano, and short ribs chile verde. Head downstairs to TR Taqueria and Margarita Bar for lighter fare (carne asada tacos, ceviche) and the namesake cocktails. Friendly servers, generous food deals during the daily happy hour (3 to 5 pm), and attractive indoor and outdoor dining areas round out the positives.